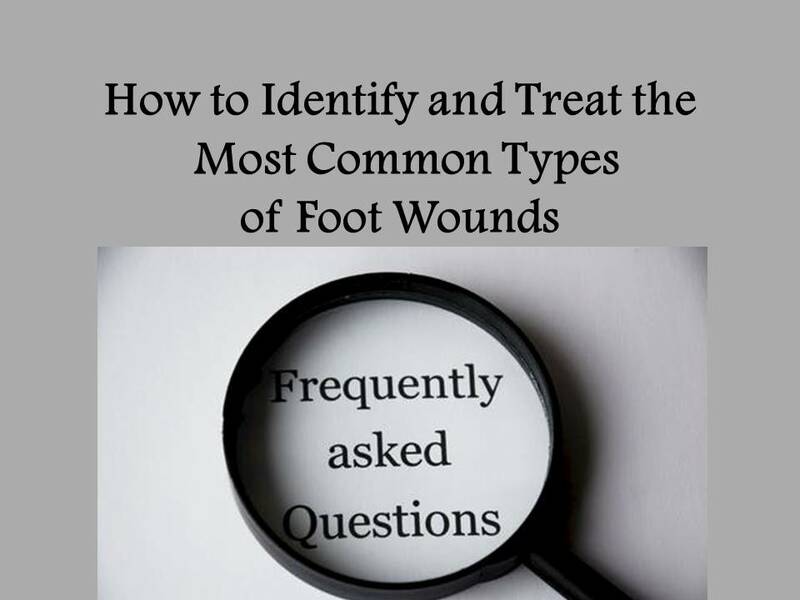 Foot and ankle wounds are due to a variety of different causes, and each wound may have several different causes leading to the development of the wound in the first place. Wounds, also known as ulcers, are areas in the skin where there has been tissue loss, leading to a breakdown in its function as the protective layer of the body that keeps bacteria out. This loss of tissue can be superficial, like what is seen in blisters, minor cuts, and scrapes. The tissue loss can go a little deeper, all the way through the skin, such as what is seen in puncture wounds, minor pressure or diabetic wounds, and deeper cuts. Sometimes, the wound can go down through fat into tendons or soft tissue known as fascia, as seen in deeper pressure or diabetic wounds, stab wounds or gunshot wounds. In some cases, the wound can go all the way down to the bone, as seen in serious pressure and diabetic wounds, gangrene, open fractures, and major trauma. Treatment of wounds depends on the depth and cause of the wound and may involve a mix of different dressing materials, de-weighting of the foot, and surgical intervention. Since wounds may have several different causes, such as some diabetic wounds being due to pressure and poor circulation, several different avenues of treatment need to be explored. Wounds in the skin can be caused by traumatic injury. This can include scrapes, burns, punctures, stabbing, slicing, gunshots, and breaks in the skin due to open fractures where the bone penetrates out the skin. In nearly all these cases, control of infection is vital as either the traumatic agent (i.e. the object doing the injury) is dirty, or the bone underneath is exposed in the process. Burn wounds, in particular, have a high likelihood of becoming infected, as do open fractures. These wounds usually need careful surgical management, except for minor cuts, scrapes, and punctures like splinters and glass that are easily removed. In many cases, closure of these wounds via suturing or natural healing needs to be delayed until the infection is resolved. Diabetic wounds, in particular, are unique out of all these wound types, as they combine elements from several of these wound causes to form a complicated and difficult to treat a type of wound. Diabetics have poor sensation, and cannot feel areas of high pressure on the skin, such as what is seen under a thick callus or where shoes rub the toes. While normally uncomfortable for those not diabetic, this pressure would normally prompt someone to change shoes or move slightly off the area of pressure, even subconsciously. Diabetics lack this sensation and will develop wounds in the skin once the pressure reaches a point under which the skin tissue can no longer survive. Poor circulation also compromises the wound, as does infection from a diabetic's inability to fight bacteria effectively. Combined with a diabetic's inability to heal wounds as well as someone without diabetes, this type of wound can be difficult to cure, and hard to prevent in the future once it has healed. To treat diabetic wounds, one has to ensure blood sugar is normal, infections are eradicated, pressure is removed by special boots, deep shoes, casts, or simple wheelchair use, and that blood flow to the foot is adequate. To counter the lack of healing potential, medicated dressings and chemicals must be used to stimulate an accelerated healing response by the body. Ulcer prevention is important, as wounds are easier to treat when they never develop in the first place. This includes protective shoes and regular foot exams with callus care. These prevention measures have saved many diabetics from leg amputations in recent years. Arterial wounds develop due to a lack of blood flow to the foot. This lack of blood flow is usually due to blockages in the main arteries in the leg that deliver blood to the foot from the heart. People who are at risk for leg artery blockages include those with high blood pressure and cholesterol, those who smoke, those who are overweight, and those who have heart disease, have had a stroke, or are diabetic. A disease can also occur in the smaller blood vessels that are found in the foot and ankle itself, and can cause a much more focused area of skin disease and wound development. Regardless of the size of the artery that is blocked, the end result is a lack of oxygen and nutrients to the skin of the foot. Without these vital components, the skin and underlying tissue cannot survive for long. Gangrene slowly sets in as an arterial wound forms. Arterial wounds are very painful due to the lack of blood flow, and will not heal unless the circulation is restored, no matter what measures are being taken to treat the wound itself. Common scenarios in arterial wounds include black gangrene and mummification of the toes, or heel wounds that are covered with a hard black crust that eventually gives way to the bone underneath. Restoration of the blood flow is an absolute must and is a surgical procedure performed by a vascular surgeon or interventional cardiologist. Procedures can include new technology that cleans out the blocked artery from the inside, all the way to a full bypass of the blocked artery segment itself. Venous wounds are superficial defects in the skin due to skin disease that is seen when veins don't function well, leading to a back-up of fluid in the legs that is supposed to travel back to the heart. This fluid can cause changes in the texture of the skin and can lead to increased skin fragility. The presence of the extra fluid can also lead to a separation of the superficial skin layer from the underlying tissue, making wound formation easy. Control and healing of venous wounds require compressive therapy to remove the extra fluid, and close management of any fluid leaking out of the wound itself that can make the surrounding skin less likely to stay healthy. Compressive therapy can include compression hose or socks, multilayer compressive dressings, or physical and mechanical compression of the legs. Numerous dressing pads have been designed to handle the extra fluid leeching out of a venous wound, with special materials that wick moisture away from the skin, leaving enough to keep the wound itself moist for proper healing. The most infamous wounds are pressure sores. These wounds have a terrible reputation as they occur in hospitals and nursing homes when adequate precautions are not taken to protect a body that is bedridden. Much like diabetic wounds, pressure from the bed will cause sores to develop on the skin overlying areas of bone prominence. For the bedridden, this will include the backside and the heel as the primary areas affected. Since those who are bedridden generally move very little, the act of constant pressure on the skin pushing against bone underneath produces terrible wounds that are likely a source of great pain for those too frail to move, even if they cannot express it well in the case of senile dementia. Devices that float the heels above the bed and special mattresses that change pressure points are used to prevent these wounds or to help heal pressure wounds that have already developed.